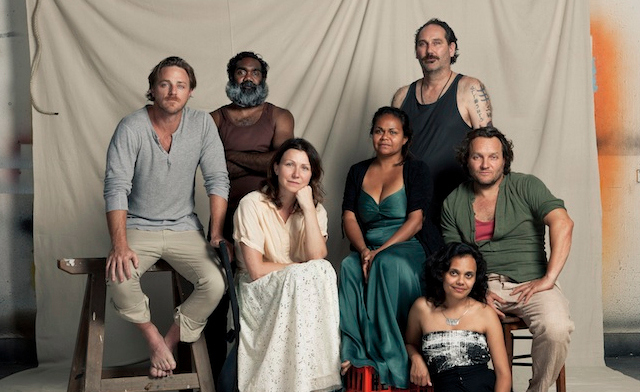 Trevor Jamieson recently spoke with Aussie Theatre’s Dione Joseph about his involvement with the Sydney Theatre Company production of The Secret River and its importance to him as an Indigenous Australian. The Secret River (2005) by Kate Grenville has been no stranger to controversy. An acclaimed Australian novel it is a first-point-of-contact story that explores the relationships between the newly arrived white immigrants and Indigenous Australians – predominantly through the eyes of its white male protagonist, William Thornhill. However, the debate will now have another form of the novel to consider: Sydney Theatre Company’s (STC) production of the work by the same name but adapted for the stage by Andrew Bovell and directed by Neil Armfield. Trevor Jamieson, a member of the 19 strong cast and hailing from Spinifex, Western Desert, is exuberant about the work and the directions that have been taken, particularly in giving voice to the Dharug people and being in a position to constantly challenge notions of authenticity and stereotypes that still prevail today. “This is a work that demands a sense of respect for the past and the people whose stories we are sharing,” emphasizes Jamieson. The need to explore new ways of engagement is also especially relevant as the production, unlike the novel where the Indigenous voices are often marginalised, if not almost completely silent, is deliberately bilingual. However, this was a learning process for the team as well. “Most of the Indigenous crew didn’t know the language,” explains Jamieson. Similarly, a huge volume of research was necessary for gaining an insight into that period and once again it was a matter of not mimicking but adapting past knowledge into a contemporary understanding. “Having people like Tess [Schofield] and Steve [Curtis] share with us so much research was invaluable,” says Jamieson. The Secret River is a work that has the potential to challenge perceptions: about written text, history and the multiple narrators, and how within the realm of theatre these stories can be heard in new ways that interrogate our default expectations. “This is a production about listening — its important that we own our histories, we own the past and this work is dedicated to the families and the ties we build – to our past but also to our present and future”, Jamieson explained.